PlanGrid partnered with FMI Corporation to survey construction leaders about how teams spend time and leverage technology investments. The results indicates that time spent on non-optimal activities such as fixing mistakes, looking for project data and managing conflict resolution accounts for $177.5 billion in labor costs per year in the U.S. alone. 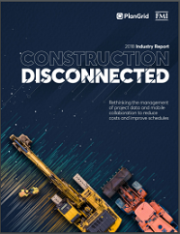 The study found that rework caused by miscommunication and poor project data will cost the U.S. construction industry more than $31 billion in 2018. Download the report to further explore the causes and consequences of these costs.